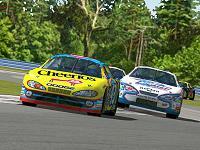 The NASCAR® 2002 Season Demo puts you in the driver's seat of a 750 horsepower stock car. Challenge top NASCAR® drivers at the Atlanta Motor Speedway® and Richmond International Raceway™ in single race mode. Switch to practice mode and hone your skills with track tours narrated by FOX television commentator and five-time Coca-Cola 600 winner Darrell Waltrip. Size: 56MB File Type: Playable Demo Buy Now! Size: 30MB File Type: Time-Limited Demo Buy Now!